I live a charmed life sometimes. Other times, well...we need not show off those wounds. I've mentioned before my most amazing friends on the planet, right? I was blessed, once again, with treasure beyond my deserving - tickets to Les Miserables. Not once, but twice. Adventure number one was quite the romantical evening out with my darling friend Chris. We have season tickets together with Melissa and Jon, but were unable to attend on our original night. We thought we'd be out of luck until Melissa called us and said she had two Orchestra tickets for Chris and I on Saturday May 28 if we wanted them. Heck yes! We started the evening with delicious chicken philly cheesesteak-type sandwiches and cheese fries, which, if you know me, you know I couldn't be much happier with the meal selection. Chris, knowing me as well as he does, also knows I do not appreciate driving in downtown SLC on busy evenings and he volunteered to chauffeur. The chill in the air and the drizzle of rain made for what could have been construed as miserable, but cutie little Chris (well, he's huge, but you know) had this umbrella he carried over my head, made sure my lil legs were adequate to jump across all puddles, and even pulled me in when he noticed my wandering self was drifting away from the umbrella coverage. I kept thinking to myself, "Man, this is kinda romantic! Too bad I'm not with a boyfriend!" But I then smiled as I realized that boyfriend or no boyfriend, my actual friends don't get much better than Chris and I couldn't have been more grateful for those moments. Adventure number two was a pleasant surprise to say the least. My friend from the womb, Scot, (yes, our moms were prego at the same time and we grew up together!) and his amazing wife, Megan, came down from Idaho with their theater friends to enjoy their season tickets at the Capitol. I was planning on meeting them for a couple hours in the morning prior to church and give them grandiose hugs g'bye. Only, it happened to be pride weekend and their friends happened to take their car up to see the parade and festivities. Scot and Megan said it sure would help them if I could give them a ride to the theater, and, hey, it sure would help them if I'd take this ticket and see the show! I'm usually a stickler with keeping the Sabbath Day holy. I have been known to make exceptions for vacations. I struggled with the decision a wee bit, but decided I would take the blessing to spend more time and enjoy the show with these lifetime friends whom I only have the pleasure of seeing once per year. And as a result of our afternoon out, I was given permission to marry Scot should Megan ever die. Precious. And twisted. Because the show was the same cast, I will share with you my collective thoughts from both viewings and a collaboration of the input from others - seeing a show with four theater gurus is an eye-opening must. Les Miserables is always going to be loved by audiences. Let's face it, they'd have to be really terrible for the audience not to go nuts, especially in Utah. Pros: Les Mis! The sets were amazing - no more rotating stage for this show, but three-story high sets and projection screening effects that I actually liked - hallelujah! The Wonderland folks could have taken a lesson from these designers. Javert. Best character, singer, actor in the show - I swear by the stars:-) The collective-cast sound was brilliant and beautiful and hit the right chord in my heart. 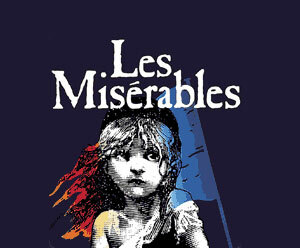 I am a sucker for a sincere tale of redemption and they don't come better than Les Mis. They cast Fontine and Cosette as a mother/daughter pair so like each other you would almost think they were the same actress - props. Cons: There must have been a special school of vibrato all of the cast had to graduate from in order to perform - they all had this same overly ample warble. I am all about classical and I know this show needs to be so, but...MAN...calm it down, I think I hear some goat mating calls in the distance. Alright, alright, it wasn't that extreme, but it made me giggle when I thought it, so I shared. Eponine, on the contrary, had no vibrato - she straight toned the heck out of everything. And, interestingly enough, she managed to change ethnicity from child to adult - reverse Michael Jackson syndrome? Valjean had a weak head voice, which really bummed me out on "Bring Him Home." His chest voice more than makes up for it, but hearing a non-strong-head voice rendition of "Bring Him Home" is like having a pizza with no cheese. For me, the shows were mainly about the company with whom I was sharing the experience. I can only dream of some day being as talented as the performers on that stage. I love that my heart is able to sing along with them and simultaneously be filled with the joy of knowing I am loved and am capable of loving so much in return. Thanks, Jean Valjean. Chris all bearded for his role in "Joseph and the Amazing Technicolor Dreamcoat"
Words can't express just how jealous I am!! It's my favorite! Ha! Scott said the SAME THING about young/adult Eponine. Although it made me sad, being as Eponine is my #1 dream role that I HATED this actor's portrayal. I agree about Javert. He was so awesome (and so easy to hate.) Hello-LOVED the sucide potrayal-SO COOL. I thought Val Jean was good but I was dissapointed with his head voice as well-although he still managed to move me to tears.